Florene A. Suitt, 94, of Topeka, passed away on Wednesday, April 3, 2019. She was born July 14, 1924 in Comisky, Kansas, the daughter of Franklin H. and Cora (Catterson) McDonald. 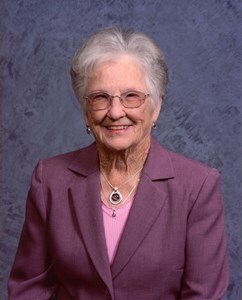 Florene graduated from Wilsey Rural High School in 1942 and attended American Business College in Wichita. She had resided in Topeka since 1945. She and her husband, Charley owned and operated the Vinewood Dance Club for several years. Florene was also employed by the Topeka Supply Depot for 14 years. She was a member of the Nucomers Club. Florene married Charley P. "Arky" Suitt on May 14, 1945 in Charleston, South Carolina. He preceded her in death on May 27, 2006. She was also preceded in death by her son; Fred W. Suitt on April 25, 2018 and her five siblings; Frank McDonald, Fred McDonald, Freda Wayman, Ferne McDonald and Francis Schieve. Survivors include their children; Michael P. (Mary) Suitt of Lawrence, Becky (James) Conley of Topeka, ten grandchildren, twenty-nine great-grandchildren and five great-great-grandchildren. A Memorial Mass will be held at 11:00 a.m. Saturday, April 6, 2019 at St. Matthew Catholic Church, 2700 SE Virginia Ave., Topeka, Kansas 66605. Private inurnment will take place at a later date. In lieu of flowers, memorial contributions may be given to Great Lakes Caring Hospice, 3715 S.W. 29th St., Ste. 100, Topeka, Kansas 66614. Add your memories to the guest book of Florene Suitt. We're so sorry for your loss. We hope and pray that God will bring you close to Him and comfort you during this difficult time. It was a delight to meet Florene several times in Mesa, AZ. She was a quiet and thoughtful lady. Our condolences to family, friends and those who loved her. It is my privilege to have known this lovely and gracious lady. She invited me into her home for delicious meals and overnight accommodations.. We enjoyed traveling to the East coast and a week in Vermont. Also,, we spent many days touring Missouri, Arkansas and Texas. I remember pleasant conversation, card games, and good times. Florene was special and I will miss her. Aunt Florene was one of the most important people in my life. I looked up to her and loved her so much. She loved us and was the best. I will miss you so much.